We have recently started playing the Grande Armée rules by Sam Mustapha at the South East Scotland Wargames Club. 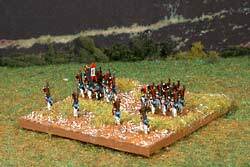 Our initial impressions have been highly favourable and a few of us have started rebasing all our existing 6mm Napoleonic figures (thousands of them) and painting up new ones. I have rebased all my Peninsular War British and Spanish - enough to refight the Battle of Vittoria (pictures here) and we are in the process of rebasing and painting troops to enable us to fight battles from the Russian campaign of 1812 (pictures here) and the Danube campaign of 1809 (pictures coming soon). We have decided to use 2" square bases for our troops instead of the 3" squares recommended in the rules. This enables us to fight larger battles on a given table size and also to have bases which look something like the brigades they represent. This was not our own idea, we found it somewhere on the Internet. The only down side to this approach is that you need to make custom rulers marked off in intervals of 2/3". How we do our bases. A how to do it guide. 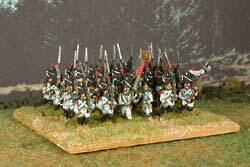 Other people have quite different ways of handling basing for Grande Armee in 6mm. Some strange individuals even use 15mm or 28mm figures. I discuss these different basing philosophies here.